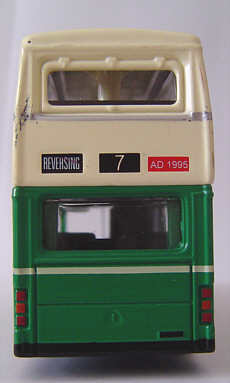 Details of this model first appeared on this site in September 2004. 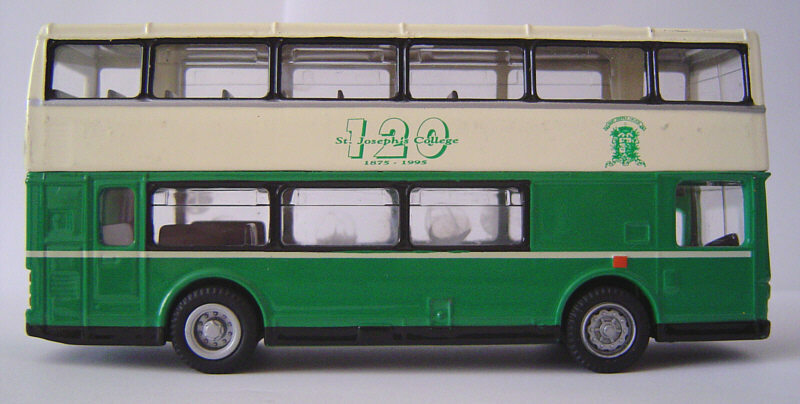 Clearly based on the China Motor Bus coach livery, the blue has been replaced with green and the model carries 120th anniversary decals of the St Joseph's College (1875-1995) It is understood that the model was issued to students who received a good report. The registration no. is AD1995, on route 7 to Kennedy Road. 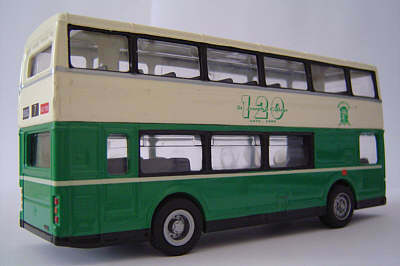 I am grateful to Marc Asby, who acquired one of these models in October 2005, for providing these photos.. 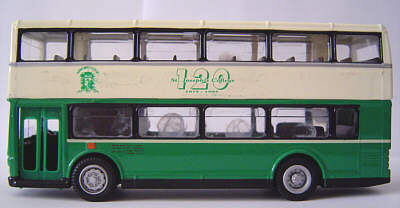 Both Marc and myself would be interested in any other information about this model. Having long been a daily visitor to your site ever since I know how to surf the net, I would first like to express my countless thanks and applause to your devotion and that of your company of friends and colleagues. 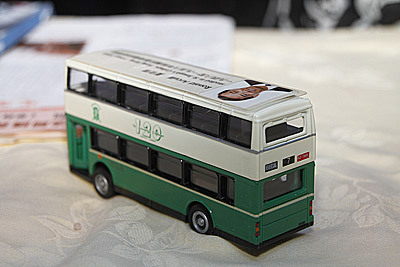 I was in Form 3 when this special bus of my alma mater was issued. We had had so much to celebrate about, a very grand Open Day (It's 120th! ), great variety shows..... and never the least, a good handful of souvenirs. Every year we have a great variety of them. 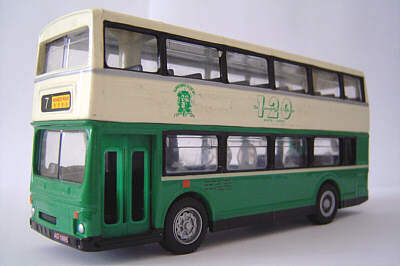 But for the bus, according to our information, it was issued not only because having a bus would sound special, but that the distributor of Corgi models then was an alumni. I've heard that the whole batch of around a thousand (or less) model buses was his personal contribution, but yet no one could prove till today. 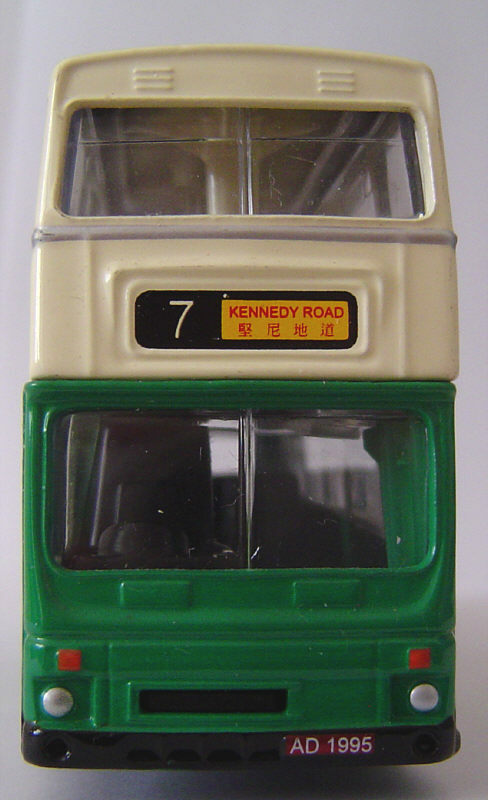 7 Kennedy Road is the address of our school, situated right between the fabulous Hong Kong Park and the Masonry House in Hong Kong. 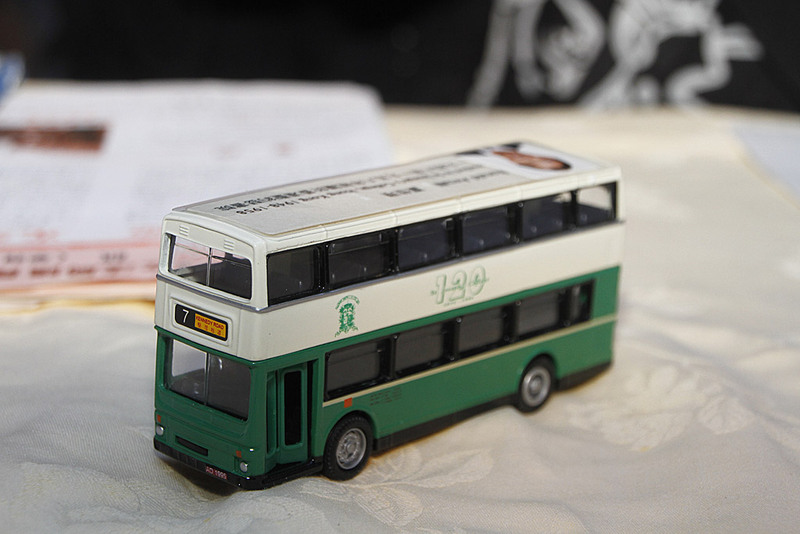 The bus was at first used as a prize to mark students' academic performances, given along with the prize certificate at the annual Prize-giving Day. Later Bro Thomas our principal would gift it to other students who pay efforts to our school - those debate team members, gazette editorials, swimmers and footballers... I received one myself when I have scored a top-of-the-year in a particular subject. It was on the 120th Anniversary Open Day that this bus was ever being SOLD. It was marked $120 each as a souvenir to old boys and visitors. No one knew the exact quantity sold. But the last ever available piece was in my friend's hands when he has completed the School Magazine editorial work. As you see, the whole bus was based on the livery of CMB MC1. Only the colour was changed to green, because our School's motto as Labour and Virtue, the characters of St Joseph to foster father of Jesus, reflected in the colours of the Lily - Green and White. My thanks to Dennis Law for sending me an interesting piece of news, and photographs, that relates to this model. 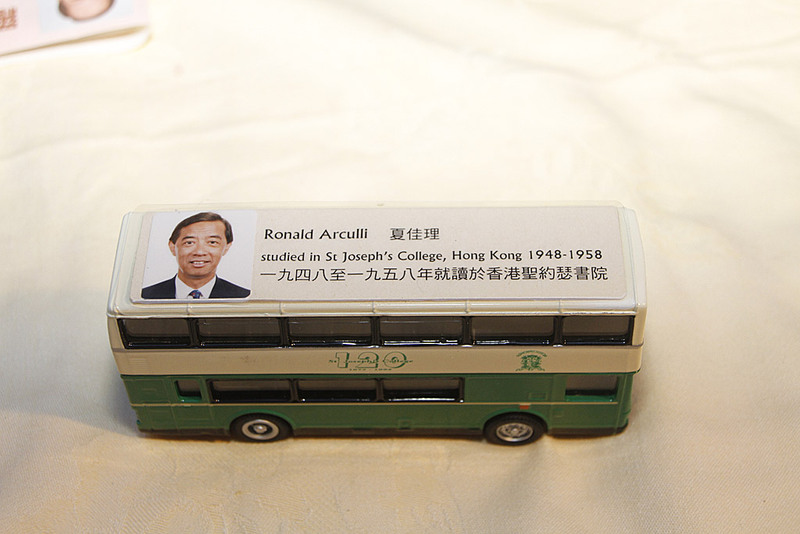 One of these models belonged to former Legco member Mr.Ronald Arculli, who put the model into Legco's time capsule on 23rd June 1997. 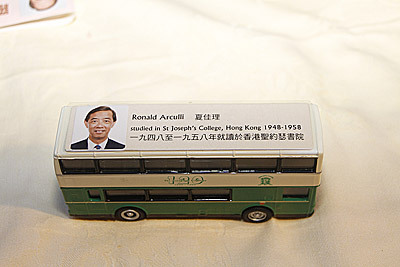 The time capsule was recovered 18th July 2011, during a farewell event marking the relocation of The Legco Building. 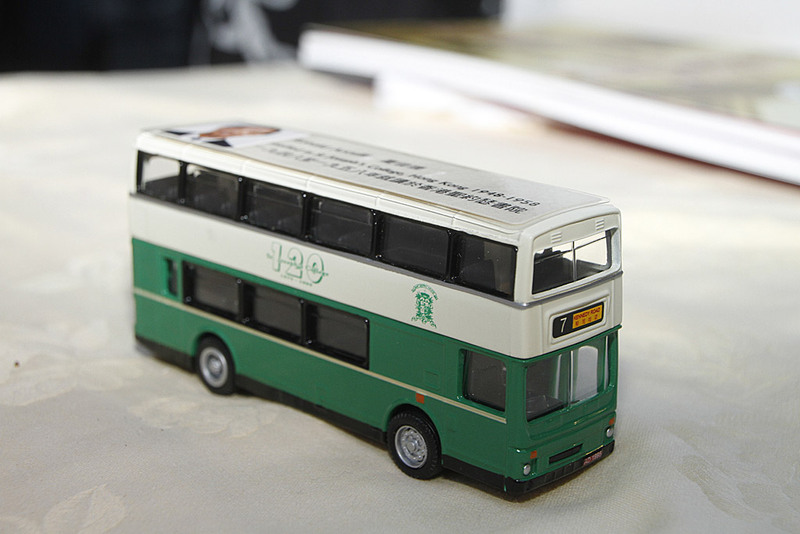 Along with all the other items which were placed in the capsule, this bus model is expected to become a display item in a dedicated museum at The New Legco Building.